Size:8inc | Color:Sliver Handle Size:8inc | Color:Sliver Handle Product Description CARE INSTRUCTIONS Hand washing recommended. When it is cleaned with a dishwasher, it might not be clean because of excessive stains there in, while residual stains will cause the knives to rust. Please do not beat, pry, or throw. Non-special cutting knife cannot cut frozen food. Do not use knife on ceramics or other hard materials. Please use bamboo or plastic cutting boards to avoid damage to the blade. We should not chop bones including fish bones with other tools except chopper knife, otherwise the blade will be seriously damaged. After using, please clean it with a soft sponge and the kitchen detergent, then wipe off the water and make it dry, and then placed in a ventilated and dry place away from the water source and the cooker. Avoid rinse and hold cycles or leaving knives to soak as this can cause staining. HOW TO MAINTENANCE Cleaning the knife surface after using to ensure that the knife surface is bright and non-rust, which can extend the life. 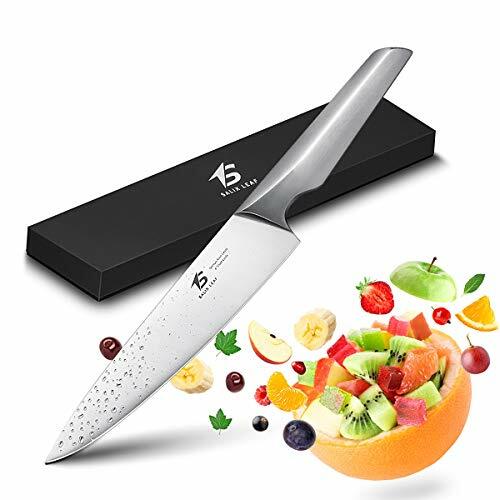 It is recommended to sharpen the knife 1-2 times per month to maintain its sharpness If the cutting edge become passivation after long-termuse. Just add some oil to the fine stone, and gently grind the blade at a 13~15-degree angle on the oil stone to restore the sharpness. WARNINGS Sharp edges and sharp points. Handle with care. Not for children use without adult in vision.